Gene Pool Cleaner & The Night Of The Cannibals - an ambitious album crafted during 2005 & 2006 - sees the culmination of 7 years graft for Dublin-based rock band Gym Slip. Having done their time on the standard learning curves of most bands their peer, gS have emerged with a stubborn sound all their own, and a crystal clear vision of where that sound is going. Fusing the wandering melodies, driving rhythms and insistent power of their many varied influences, gS are reaping the musical benefits of an almost linear evolution. 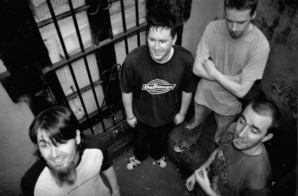 That progression began to peak with 2004's crowrubbishempire, a 7-track offering which brought the band to radio airwaves, hundreds of CD collections, and numerous well-received gigs in towns all over Ireland. It continues with Gene Pool Cleaner & The Night Of The Cannibals, a murder of songs already road-tested, and the most faithful capture to date of the gS sound. Capping this musical summit is the common theme tying together the individual strands of Gene Pool Cleaner & The Night Of The Cannibals. Embracing the one medium feared by most - the concept album - gS have managed to mould a soundtrack to a tale of the inevitable: the Gene Pool Cleaner - increasingly despaired in an existence bruised by ignorance, greed and irrelevant values - stumbles upon a simple solution, and goes to work. Gym Slip are also at work. Click on the icon to download mp3s of selected tracks.